Cameras Downunder Gallery - Subminiature/Binoca 16mm camera. photo 2. Binoca 16mm camera. photo 2. White Bakelite? 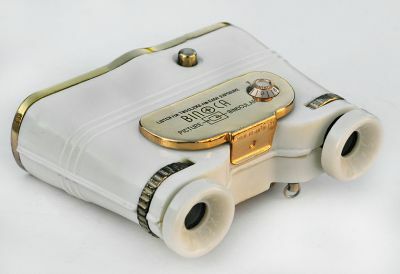 Picture-Binoca 16mm camera with build-in 2.5x Opera glasses with adjustable visibility on eye glass. Lens: Bicon 4.5/40mm, shutter B. 25-100. Made by Binoca Co. Japan Ca 1950.